…in a trance-like state of awe and wonder. I can see things in it without knowledge. Deeply felt belief in the men’s faces. Grace and strength in their twisting figures. The woman’s beauty and her universal expression of maternal love. I can revel in the colors – strong without being garish – and the folds of the fabrics. As I continue to look, I might be puzzled by what the angels are doing, by the weird figures carved on the base of the plinth and also by the wisps of smoke in the air – hard to see in this photo. However, my Mowgli-eye would keep returning to the humans, especially the man on the right. His face. His left hand, curved round a book. And I would know that he was urging upon me a strongly felt emotion which comes straight from his heart. To mine. For a few long moments, that seems enough. 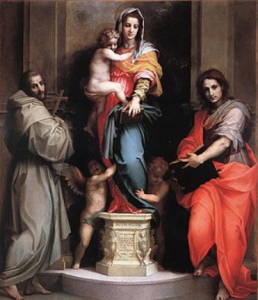 So leaving Bagheera and Baloo behind, I first acquire the basic data: The painting is titled ‘Madonna of the Harpies,’ by Andrea del Sarto and is considered one of that late Renaissance/early ‘Mannerist’ artist’s finest. It was painted in 1517 for the Convent of San Francesco dei Macci in Florence. And then I learn, and my interest quickens, that to art historians, the symbolism or ‘iconography’ of this work is shrouded in mystery. The first of these are the curious winged figures on the plinth with women’s breasts and a stinger between legs spread apart. Very unlady-like and hardly the thing to put before the Poor Claires, the nuns who resided in the convent. The figures are harpies, straight out of the Book of Revelations, to which the figure on the right, no doubt, is pointing in a meaningful manner. Mystery two is what the angels are up to. In traditional Madonna paintings, cherubs lift (if an Ascension) or they whirl through the air round the Mother of Christ. Here the angels hold the Madonna down. Mystery three: those puffs of smoke. Del Sarto’s iconography expresses his belief. It was tumultous time in Florence – and all across Europe. In 1517, Martin Luther wrote his Ninety-Five Theses protesting the sale of indulgences by the Church to finance the rebuilding of St. Peter’s in Rome (and sent them to his Bishop, by the way; he did not nail them to the Wittenberg church door). However, the groundswell of dissatisfaction with the church was already decades underway – and so was the Counter-Reformation. Savonarola had been hanged and burned in front of Florence’s Signoria almost twenty years before del Sarto’s painting. But, as Macchiavelli noted during a visit to Florence about the time of del Sarto’s painting, the Ferrara friar’s Apocalyptic visionary sermons were still being preached in Florentine churches. Central to Counter-Reformation thinking was the Madonna, that benign, accessible intermediary between erring man and a stern masculine God. And so the mysteries resolve themselves. Those puffs of smoke? They come from Hell, which Savonarola and his like had temporarily taken the lid off of. Madonna stands on that lid, and the angels help hold her down so that harpies and other Beasts of the Inferno, including the Anti-Christ, are not let loose. The figure on the right is St. John the Evangelist, author of the Book of Revelations. His glance carries a warning, for harpies feature in his description of the Apocalypse. By the way, St. Francis, the figure on the left, is in the painting because he was the patron saint of the Poor Claires. As a slight digression, it is worth noting that art historians do what criminal investigators (and crime writers) do. They piece together clues from the scene of the art work/crime and the broader context of time and place; they sift the evidence, weigh the facts, propose hypotheses and test them. Returning to the rather simple point of all this – and apologies if it strikes you as self-evident: educating yourself about a painting can add to your enjoyment of it. But the key word here is ‘add.’ Knowledge is like Schlag – empty and meaningless without a rich desert underneath. Which brings me back to the Mowgli moment, that visual and spiritual current of energy which shoots straight off canvas or frescoed wall or carved figure through my optic nerve to the emotional receptors inside. There are no Latin words for that phenomenon. There are no words at all.